On Wednesday 6th April, RGCL were very pleased to welcome Prof. Mikel Forcada from the University of Alicante, Spain. Mikel is currently undertaking a sabbatical in England and we were very pleased that he could spare the time to visit and to give a talk to our Research Group. The talk, about translation technologies, was well attended and very well received! 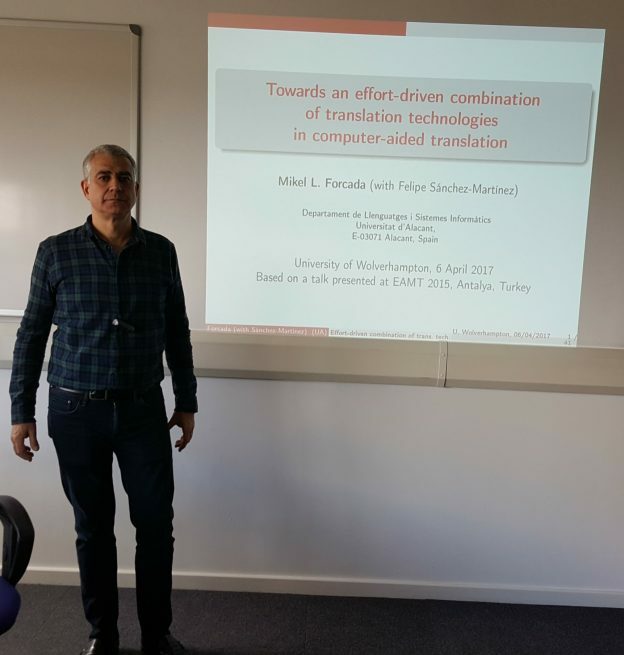 The talk puts forward a general framework for the measurement and estimation of professional translation effort in computer-aided translation. It then outlines the application of this framework to optimize and seamlessly combine available translation technologies (machine translation, translation memory, etc.) in a principled manner to reduce professional translation effort. Finally, it shows some results that point out at existing challenges, particularly as regards to machine translation. This entry was posted in Seminars 2017 on April 7, 2017 by riilp.